‘Twas inevitable that this book was going to be reviewed early on on a blog that is edited by two Kiwi lasses. 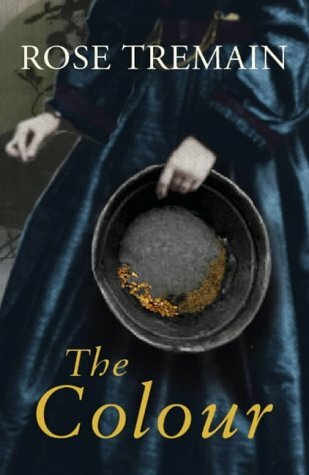 Set in New Zealand in the mid-nineteenth century, Tremain’s The Colour is a historical fiction that displays the beauty and hardship of a newly colonised land. Beautifully desperate, this is a highly entertaining read which I found hard to put down. Our story opens with the arrival of newly-weds Joseph and Harriet, along with Joseph’s mother in New Zealand. Recently colonised, it is a harsh and hard place, brimming with excitement over the recent discovery of gold. It is viewed very differently by our three new arrivals. Joseph sees it as a new beginning; he is in New Zealand not because he wants to be but because he had to leave England. He views New Zealand as a necessary hardship to endure if he is to be successful financially and successful at forgetting what drove him from England. Harriet is escaping too, but it is the restrictive life of an ageing governess. Through Harriet we see New Zealand as hopeful and beautiful. The open landscapes represents the freedom that is now available to Harriet. Lillian is Joseph’s mother and is there because she has recently been widowed. This is not an adventure for her, not a new beginning because she is there under duress. Through her eyes we see the savagery of this new land, a lack of civility, a bleakness in the surroundings where the open space is oppressive, directly in contrast to the views of her new daughter-in-law. The relationships between the three of them are tenuous; Lillian is resentful of Joseph for bringing her to New Zealand and wary of Harriet and her enthusiasm. Joseph and Harriet barely know one another and are unsure of what it is they feel for one another. Disappointment and resentment simmer beneath the surface for them all, hidden beneath a veneer of hope, of trying to make the best of this new opportunity. Harriet seems to grow and adapt well to their new surroundings, Joseph and Lillian the opposite. When Joseph discovers gold, or “The Colour” of our title, the cracks in the trio become gaping. Joseph becomes frenzied, believing this to be the answer to all his worries. He can appease a miserable mother, show his new wife that he too can be resourceful, start making a way towards atoning for what he did back in England. Believing that this is just the beginning, Joseph leaves his new wife and his mother to venture into the gold fields, revealing much in this decision which would see his new wife and his elderly mother to rough it out on their own. There is a lot going on in this novel. Around our new arrivals, there is a number of minor characters who also have their own distinctive voices and developments. Tremain neatly ties them all together and manages to never let all the emotions and actions become too overwhelming. And not to bang on, but there really is a lot happening. Death, birth, destruction, flooding, gold, near drowning, rent boys, Chinese men, miners, a mystical Maori nanny… Actually, about that last one. This was the one aspect of the story that didn’t quite work for me. In amidst all the harsh realism, Tremain introduces the character of Pare, a young Maori woman who is taken on as a nanny by a neighbouring couple. I appreciate what Tremain was trying to do with Pare; the Maori culture is a very big and important part of New Zealand. And the magical realism could have proven a nice counter-point to all the harshness. But it never really felt like it was part of the story, rather that it was running along side, then falling behind and eventually I found myself wanting to skim over those parts. It felt forced and did not add anything to the story. However, with all the other exciting parts going on, it is overshadowed by what is a big story told with a quiet eloquence. I needed to know the fate of our three and I was not disappointed with the outcome. I couldn’t predict what was going to happen at any stage of their journey with the ending being the biggest surprise of all. I highly recommend this to fans of historical fiction. I highly recommend this to fans of great writing. Frankly, I highly recommend it to everyone who loves a fantastic, unpredictable tale; well, those not too squeamish as there are a few squirmy parts in there. A 4 out of 5 star-rating.